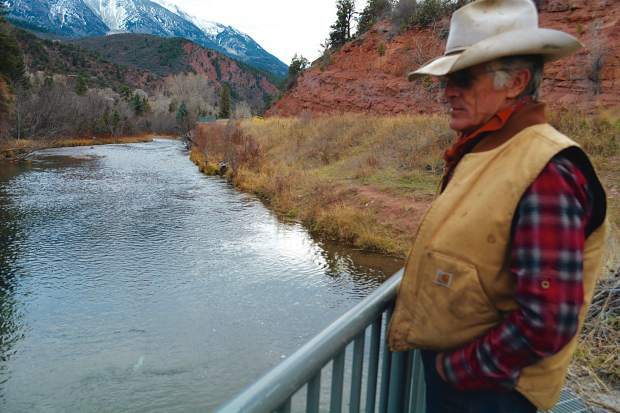 The three-year agreement will compensate Bill Fales and Marj Perry, who own the 600-acre Cold Mountain Ranch just west of Carbondale, for retiming their irrigation practices to leave water in the Crystal River when it needs a boost. Under the terms of the agreement, the Water Trust will monitor flows in the river and, if flows fall to 40 cubic feet per second (cfs), the ranch may voluntarily shift its diversion scheduling. The Water Trust will then measure the changes in the ranch’s irrigation practices and pay Fales and Perry $175 per cfs per day to encourage that shift. Once streamflows reach 55 cfs, the payments would cease. The pilot agreement can restore as many as 6 cfs per day in the Crystal River for a maximum of 20 days in August and September (no other months are included), offering a maximum payout of $21,000 per year to Cold Mountain Ranch. Although the Colorado Water Conservation Board has an environmental instream flow right on the Crystal, the water right dates from 1975, far lower in priority than the major agricultural water rights on the Crystal — and thus is of little to no use when the river most needs water. The Water Trust began consulting with local ranchers and farmers whose senior water rights could be useful during times of drought, asking whether they would be willing to lease some of their irrigation water for the Crystal’s benefit. And many were. The end result, Smith said, will bring the same environmental benefits for the river. What’s more, the pilot agreement mark the first step toward implementing the Crystal River Stream Management Plan, released in 2016, which helped quantify the ecological needs of the river. And it means Pitkin County can finally fulfill its long-stated goal of putting more water in local rivers through the Healthy Rivers and Streams program. For Smith, the process of working out this kind of arrangement also has broader lessons for other water conservation efforts involving conservation easements. Back in 2012, the Water Trust thought it had a leasing agreement that could be rolled out in different river basins throughout Colorado. Now, Smith said, he’s learned that what works in one community might not work for another. “We need to be flexible,” he said.